Conflict Communication - RGI utilizes Verbal Defense & Influence (VDI) and other proven methods to impart the skills needed to create voluntary compliance. RGI methods resolve verbal conflict under all circumstances, including military, law enforcement, family, personal and business conflicts. Cross-Cultural Conflict Resolution - RGI has years of experience in how to resolve unproductive or violent situations in tactical, law enforcement, public and business settings that have resulted from cross-cultural misunderstanding, mutual distrust or disrespect. Typically, RGI Communication Skills are taught in combination with the RGI Ethics and Physical Skills Programs. RGI has partnered with Vistelar and trains RGI attendees in the Verbal Defense & Influence de-escalation method. VDI is guaranteed to reduce complaints, liability and injuries, while improving performance, morale and overall safety. The program also has internal benefits proven to improve organizational performance and employee morale, while reducing internal bullying and workplace stress. Verbal Defense & Influence training is aimed to prevent and manage conflict using Non-Escalatory and De-Escalatory verbalization skills. The training is aimed at preventing the "negative dance" from starting - and if already started, to de-escalate it before it gets out of control. It is by far the best reviewed and most effective verbalization program available. Train to verbalize in a manner proven effective to prevent/reduce conflict using non-escalatory and de-escalatory verbalization tactics for purposes of reducing risk by preventing and/or reducing the chances of injury, complaints, and to reduce liability. 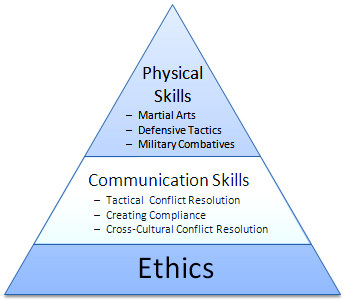 Appropriately respond to conflict, manage verbal abuse, keep conflict from escalating into confrontations, defuse confrontations, de-escalate violence, maintain personal safety, build cooperation and collaboration, improve community relation skills, conduct difficult conversations, lower workplace stress levels, and enhance professionalism. The program is highly engaging and interactive. We train beyond lectures. The focus on non-escalation verbalization skills is just as important as de-escalation. We also use an Emotionally Safe Performance-Driven instruction that involves videotaped role plays – allowing the class to practice, critique, and continue to practice until the skill is learned. © 2019 Resolution Group International LLC. All rights reserved.